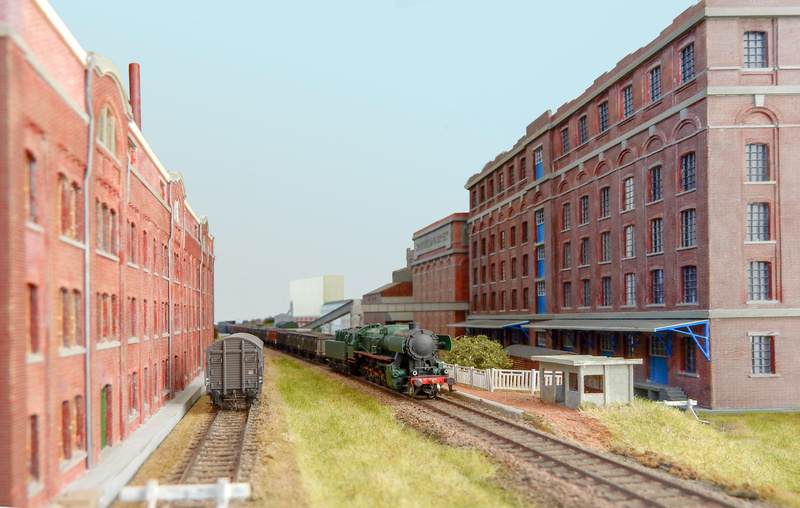 An example of scratchbuilding to create an industrial environment as setting to view your trains. But it are not the dimensional differences between standard N and fiNe-scale that make you into a fiNe-scale modeller. There are in fact essential ingredients that make up a fiNe-scale modeller. FiNe-scale modelling has everything to do with a philosophy and attitude applied to your work. Closer to prototype, visual appearance and better performance are all important. And this can be applied to all sorts of modelling whether it is loco building, landscaping, signalling and layout operation, wagon or coach building etc. Choosing your own prototypes in modelling instead of those offered in the shop will distinguish your work. Please forget the idea that if stock comes from a major manufacturer it will probably be OK, because they have done their homework. In lots of cases it won't be OK, in order to shrink the development time to minimum they have taken all kinds of liberties to produce a result that just will suit the average modeller. A real modelling approach offers advantages. In the first place it gives more satisfaction. Another one is that you have to realise that in most cases time will form a natural limit and not the financial resources. At best you can buy some components that you need but more often you have to scratchbuilt items. As a result the costs per hour of your hobby will be much lower. Also big projects will fall outside your scope thus smaller spaces will suffice for lodging higher quality models. Also you have to find out a lot more about the prototype for your own projects. This can be a hobby in itself, offering lots of pleasant hours. If you are the type of person that wants to have instant results or buy it in a shop and put it on the train table then you better refrain here. However if you are a modeller that gets satisfaction from better visual appearance with modifications and additions to commercial products then please read on. In most cases the fiNe-scale approach doesn't cost more time. You just have to learn to apply the same materials you probably already use with different techniques, use more care in the blending of colours and combination of products. Combined with a critical view on your own work to see if the dimensional accuracy is still there and dare to reject items that are too coarse or need a redo. Only a critical look comparing with photos and drawings of the prototype will reveal if items are acceptable. Often a good approach is to regard r-t-r products as useful starting elements that can save some work. On the other hand rigorously rejecting everything with a small blot will not bring you any further. Somehow you have to find a fine balance between time available and modelling ambitions. Progress in your results is the main drive for a fiNe-scale modeller and don't be afraid to venture new roads in your modelling. Seeing your first home built loco rolling first time under its own traction is very satisfying. Learning by doing is the way to built experience. But be sure that on most roads many people have gone before you. Modellers that have written down their own experience in order to help others. Thus the best start is by reading and learning from other people. This often avoids traps or dead ends which save effort, together with visiting shows, club meetings and attending seminars or get-togethers for direct contact. In my view there are two clubs of which membership offers advantage. That are the 2 mm Scale Association and FREMO. For modelling rolling stock in N useful knowledge can be found in the archive of publications from the 2 mm SA, mostly those before 2000. The 2mm Association can be still be a help in saving time, particularly their spoked lcocomotive wheels and wagon wheels are helpful. Current 2mm modelling finds itself in a deadlock still using etching technique, expensive and out of focus on the continent, but its OK for small niche items which profit from being metal. For current state of the art technology explore this site for 2.5 and 3D approaches via CNC milling and 3D printing, but still the watchmakers approach using jewellers saw and files has its own place. Further techniques like laser cutting/engraving and use of the Silhouette/Craft Robo cutter can be found as well, but these don't have my focus. Look in the link section for more laser cutting and engraving by other Fremo members. FREMO offers practical workshops, seminars, running sessions and a wealth of knowledge on 1:1 railways and their workings together with lots of meeting events all over central europe. Standing strong in developments of modern electronics like DCC applied with sense into models this club points the way forward. The FREMO forum forms a valuable platfom for questions giving fast response times with helpful answers. A good approach would be to visit a FREMO meeting to see and find out all about fiNe-scale in person. Check out the Fremo button in the top ruler for our next meeting locations with fs160 focus. An overview of the working set of fiNe-scale standards on this site. Full set of all FREMO-N standards on modular approach complete with many tips and description of best practice. Also 'modern' image is perfectly feasible in fiNe-scale .